This traditional medicine cabinet belongs to the exquisite Perri design series. It features a rectangle shape. This medicine cabinet is designed to be installed as a wall mount medicine cabinet. It is constructed with birch wood-veneer. 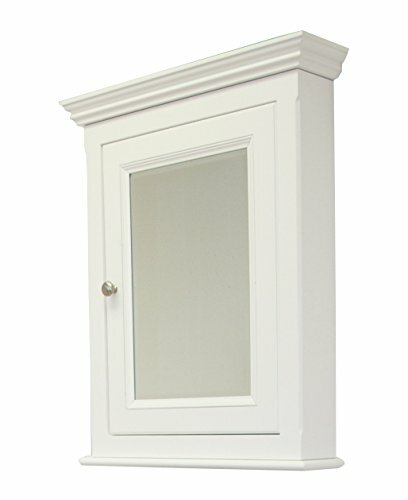 This medicine cabinet comes with a lacquer-stain finish in White color. Sleek medicine cabinet featuring a large soft-close door with mirror. Accessories not included. Constructed with american birch wood and veneer. Solid wood framing. No MDF or chipboard used. Finished with a multi layer 7-step stain finish. Stain finish enhances the grains of natural wood and gives it a luxury look. Includes a high quality premium glass with bevelled edges. Full plywood back to cover the glass with a nylon seal to avoid moisture buildup. Completely finished from all sides. No assembly required. Includes pre-installed wall hangers to aid installation. Includes two adjustable glass shelves inside the cabinet for ample storage. Concealed screw installation for a clean look. Reversible door that can be installed to open either to the left or to the right.